от 50 шт. — 112 руб. от 100 шт. — 107 руб. Добавить в корзину 10 шт. на сумму 1 200 руб. 891 series 2.54 x 2.54mm IDC ribbon cable sockets with military polarization and centre bumps. 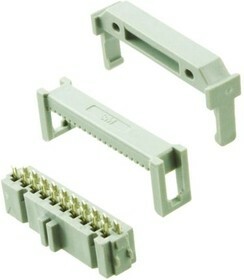 These 891 series IDC ribbon cable socket connectors have a double-recessed cover which allows cable to be terminated from either side and are supplied preassembled.